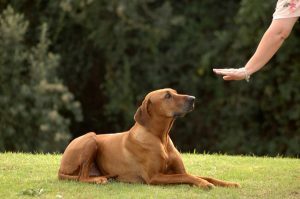 Most folks are aware of the fact some basic obedience training makes dogs more fun to be around. 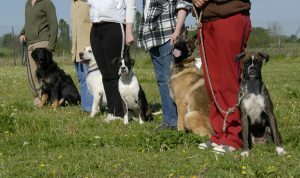 What many of us do not know is basic dog obedience has many other, less obvious, perks. Obedience training helps your dog see you and your family members as their leader, much like a younger child may see their parental figures. It also gives your pup a much needed mental workout, something many canines need just as much as they need physical exercise. A mental workout helps dogs of any breed fight off boredom and makes them feel useful. Some commands, like a good recall command, may even save your dog’s life one day. Dogs, by nature, are pack animals with a prominent social order. As you and your family become members of your pup’s pack, your new dog will communicate with you – the leader of the pack – for direction. This form of leadership can be established in a firm but friendly manner, if done correctly. Keep in mind it is unrealistic to expect your pup to abide by the rules of the household without the leader introducing, teaching, and training the appropriate behavior! Much like people, every single dog is different. Some are hyperactive, laid-back, serious, lazy, silly, shy, and yet others have too much confidence and can literally just be out-of-control. Regardless of these differences, training is necessary for all dogs and extremely beneficial to your entire family. How Can Training My Dog Help Me? Help correct nuisance behaviors such as jumping on people, digging, barking, and chewing, while also providing mental and physical activities for your pup. Strengthen the relationship between you and your pup, and increase the enjoyment, companionship and satisfaction of your relationship with your dog. Nurture good canine companionship for the benefit of your family, neighborhood, and community. The best advice is to start training early! Training a puppy is much easier than training an adult dog because a puppy is more open to new ideas and has not yet developed “bad habits.” While it’s best to start young, the old saying, “You can’t teach an old dog new tricks” is only partially true. It is never too late to train your dog, although it may take a little more time and dedication to eliminate undesirable habits. Our team at Come & Train It K9 offers effective training programs for all levels of your pup’s life. We’ve successfully worked with puppies and older dogs all over the Houston area. Do you have questions for our team before getting started? Give us a call today! We’d love the opportunity to earn your business!